John Crellin's blog. 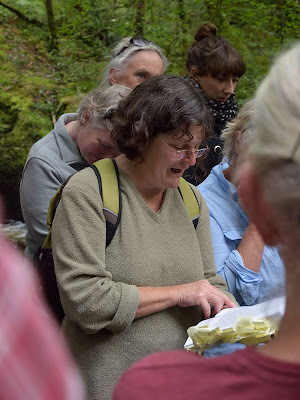 Now mainly about botanical recording in Brecknockshire. 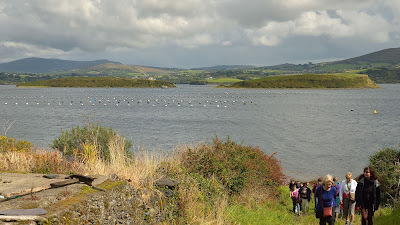 After Cwm Oergwm we decided to drive over to West Cork for the Ellen Hutchins Festival which had started the previous Sunday (with a climb of Knockboy - the highest mountain in Cork where Ellen made some of her discoveries). 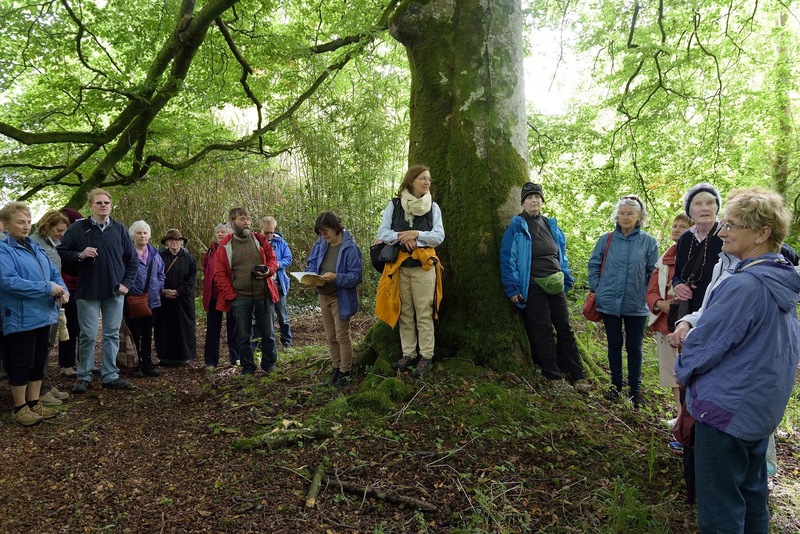 The festival week was celebrating the 200th anniversary of the death of Ireland’s first female botanist, and promised to ‘follow in the footsteps’ of Ellen, visiting her favourite plant hunting grounds such as Whiddy Island and Glengarriff Woods. There were also to be talks, an exhibition about her life and work, visits to her birthplace, home and burial site, and an exhibition of her artwork. So what was the significance for me and my wife? 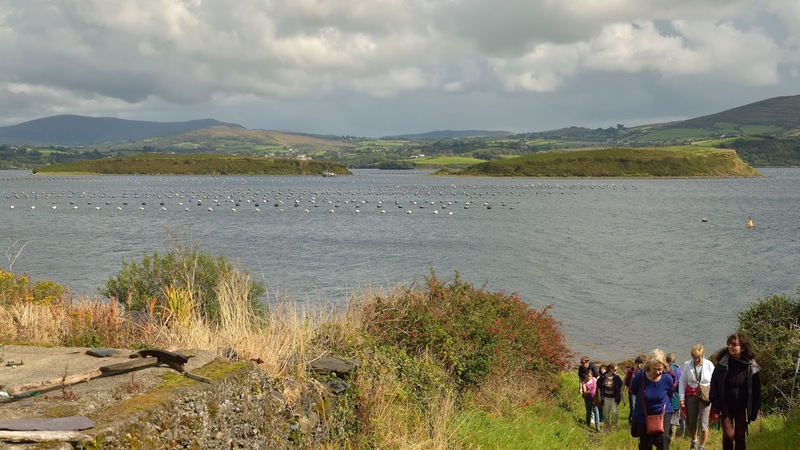 I had been hearing about the renowned local botanist, who was born a stone's throw from the house where Barbara's parents lived, since before my general interest in science morphed into a particular fascination with botany. And the more I have learned about the story of her life the more remarkable her achievements turn out to be. 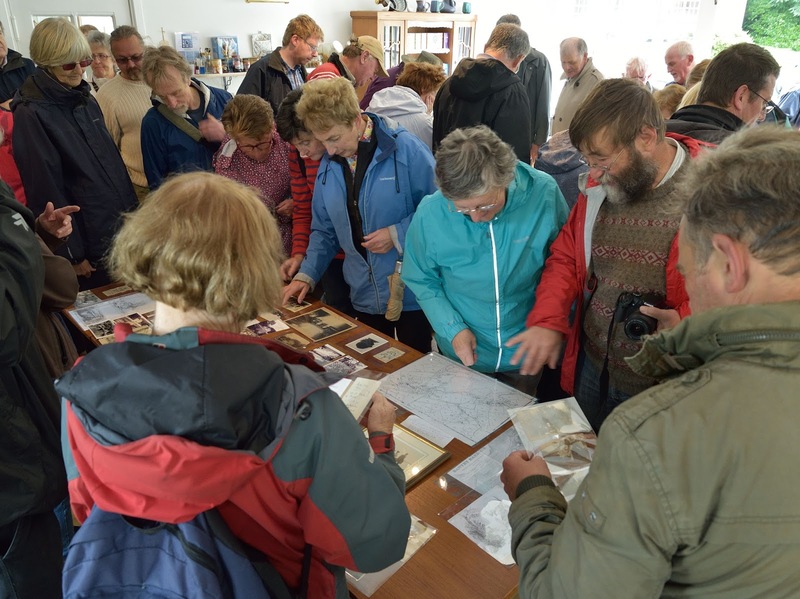 The festival last week filled in a lot of detail of a fascinating story. The church is ruined and burials ceased altogether in the 1980s but Garryvurcha graveyard has been recently restored from wilderness. Unfortunately the actual site where Ellen was buried is now unknown beyond being described as "outside the southern wall of the old church"**. For much more detail than I can give here see the Ellen Hutchins website but it is important to realise that, when she was living in West Cork, communications were considerably poorer than now and she and her family were very isolated in one house of two at Ballylickey about four miles from Bantry and a mile or so from a brother living at Ardnagashel. 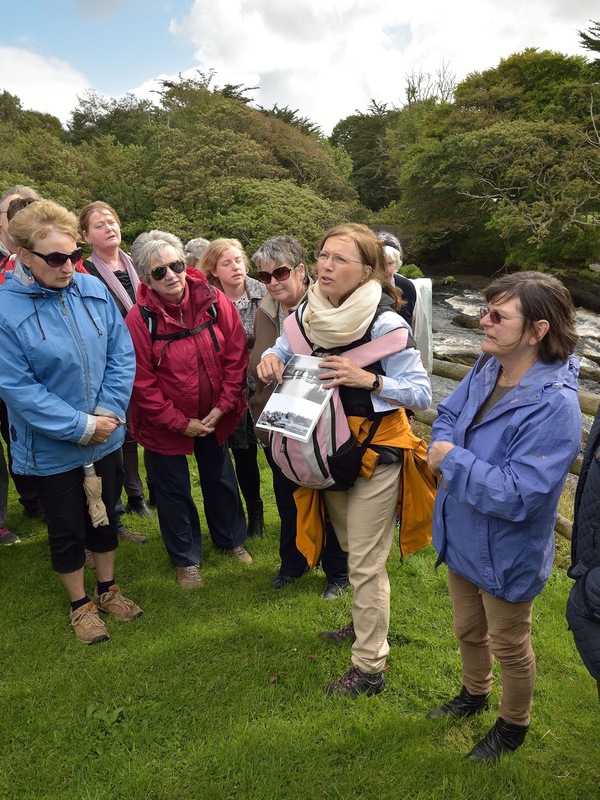 She was introduced to botany in Dublin by a family friend and also introduced by him to James Mackay, Curator of the Botanic garden at Trinity College, Dublin. 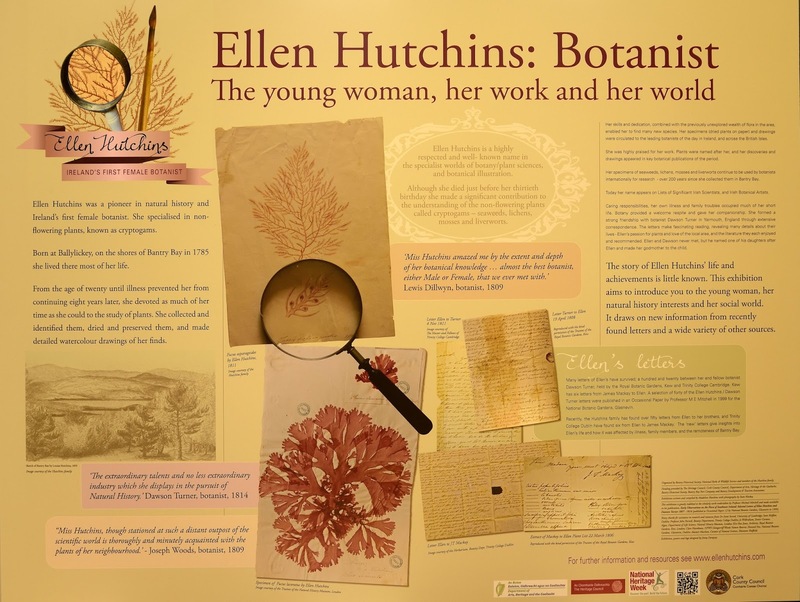 Back in Ballylickey she pursued her botanical explorations from the age of 20 until illness prevented further practical work, but not her interest in the subject, eight years later. During this time she struck up a lengthy correspondence with another botanist, Dawson Turner a botanist in Great Yarmouth. Her letters to Mackay and Turner form an invaluable resource and insight into her life and achievements. Eliane Zimmermann and Madeline Hutchins start the walk. Ballylickey house, birthplace of Ellen Hutchins and more recently an exclusive hotel where John Lennon and Yoko Ono stayed (amongst many others). The house design is close to the original, barring the extension to the right, but has been rebuilt after a fire since Ellen's time. Under one of the very large old trees in the grounds being told more about Ellen's life. An exhibition of historical documents at the end of the walk. The hilltop fort on Whiddy as we approached and where we would later be standing. 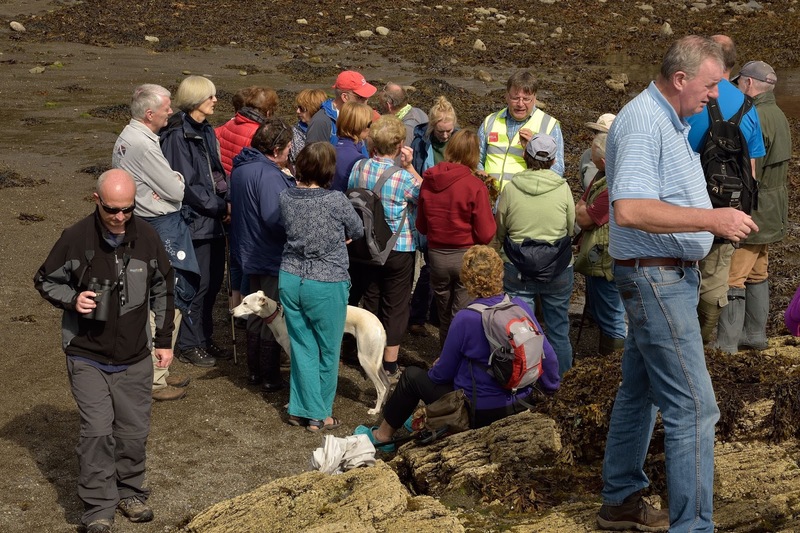 The walk was led by Dr Micheline Sheehy Skeffington (former National University of Ireland, Galway botany lecturer). Walking up from Whiddy beach towards the old fort. View back to Ballylickey House centre right - the speedboat is apparently making for it. The old national school on the island, still active within the memory of some participants. 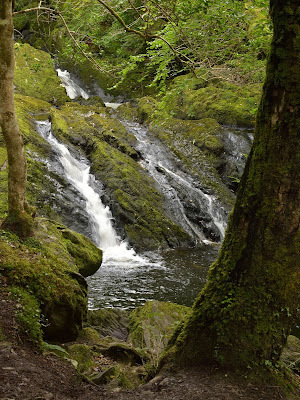 Several plants that Ellen first recorded on Whiddy can still be found where she reported them (one - Dwarf-elder grows nowhere else in County Cork). Irish Spleenwort, or Asplenium onopteris, one that hadn't been characterised in Ellen's time as different from Black Spleenwort. 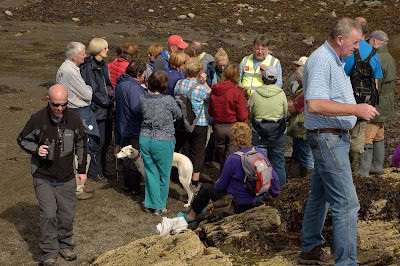 This was found relatively recently on Whiddy by botanists from Sherkin Island. A few of us went to seek it out after the main walk. 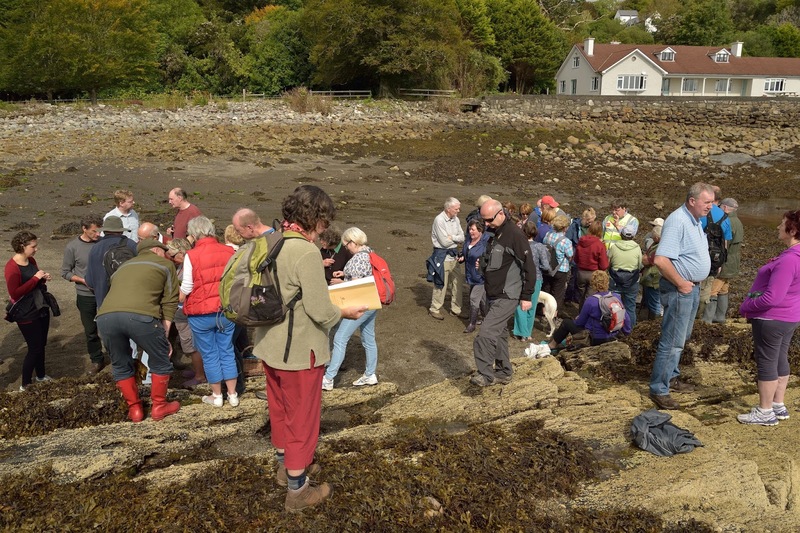 Next, the seashore at Ardnagashel. 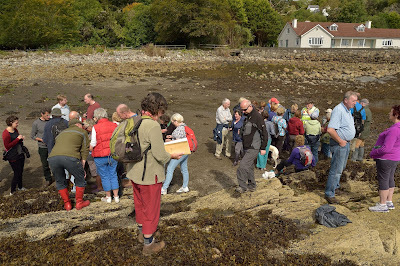 Ellen became a particular expert on seaweeds (an interest of Dawson Turner's) and found many new species. A seashore lichen on rocks. Howard showed us that nearer the water line a black lichen grew - nicknamed "Tar Lichen" and was one that had to be pointed out to be natural and NOT tar after the Whiddy disaster. We have one (?) tree with this in Brecknock! Golden hair lichen, Teloschistes flavicans which was known as Borrera flavicans in Ellen's day. We ended the walk at the waterfall which is believed to be the one described by Ellen as a very favourite place in a letter read out by her great great grand niece. Madeline Hutchins reading from Ellen's letter. 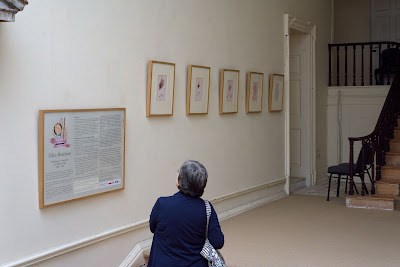 We missed the exhibition opening at Bantry House of her botanical illustrations so went to that for a good look round on the Monday. 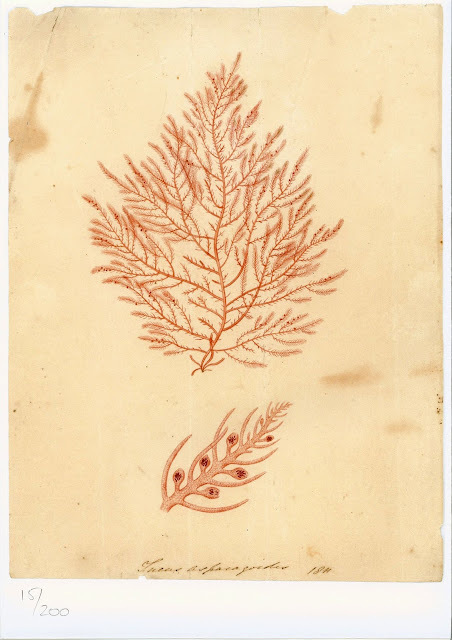 The drawing are both beautiful as well as scientifically detailed and accurate - invaluable in the age before photography (and botanical illustration still is important I have to add). We bought this reproduction of her drawing of Fucus asparagoides made in 1811 which was sold to help support the festival. I trust it is OK for me to show a scan here. It is, of course copyright of the Hutchins family. Hutchinsia, Hornungia petraea which was known as Hutchinsia petraea so the "Common name" 'Hutchinsia' has been assigned to it by the BSBI to preserve Ellen's name - I photographed this in Bristol in 2007 - it is a very tiny plant and hard to find! A lovely sunset the evening before we set off for Rosslare to return. * See Famous Female Botanists for a list of famous female botanists; four of whom did pre-date Ellen (none were Irish). ** I have made some corrections to my earlier erroneous assertion that it is not known for certain whether Ellen is buried in the churchyard. Thank you to Madeline Hutchins for putting me right on this.